Anyone noticing reduced speed in the past week??? Forums › Slingshot and CallPlus › Anyone noticing reduced speed in the past week??? Looks like the speed reduced for both international and national website in the past couple of weeks. Watching england vs france tvnz live streaming now. It seems the ondemand is buffering forever. Anyone else noticing reduced speed too? Have you in that period changed routers, added phones, changed filters? Have it been raining in your area? Could you please post modem stats? Same settings for the past couple of years. No rains, weather is clear in Auckland. I will look up for modem stats now. Not here. I've noticed the complete opposite. Massively increased speed for the last week or so. I was just about to post a good on ya slingshot thread but saw this first. 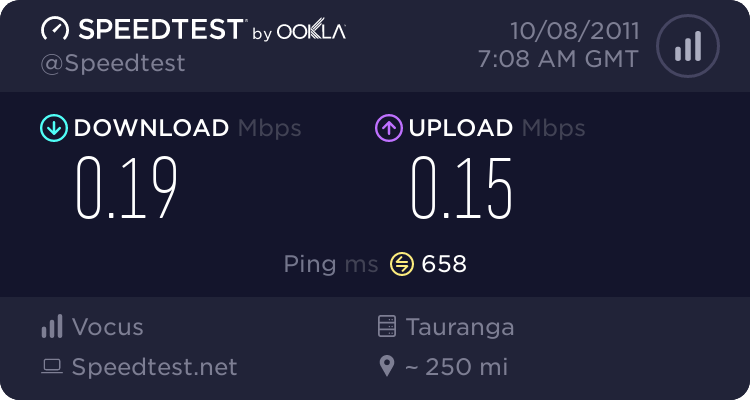 Your speedtest.net results look awfully close to a throttled connection - gone over your cap? Although your attainable line rates suggest you should get a few mb/sec at least - perhaps check your filters. I am having the same speed slowdown issue. It used to be 500KB/s sustainable download speed via http during morning time. Now it starts at 500KB, quickly drops down to 100KB/s. If I open up a new connection on the same download then the speed will go back up to 500KB but soon drops back to 100KB. I am on the new Broadband 50g plan. Just looking at your line stats, you are only getting around 10% of the download speed your modem thinks it should get and thats around half of what the line attenuation is capable of. I suggest you get your wiring checked, with 36dB attenuation you should be able to get a sync speed of 8-10Mb/s not the current 0.5Mb/s. As for why you are only getting 0.18Mb/s of TCP speedtest throughput, well thats either an ISP issue or maybe your modems having high packet loss due to its poor signal condition. From the look of things you have a physical line fault either inside or outside the property effecting your local sync rates. Could you PM me your account details and I will take a look and try to help.